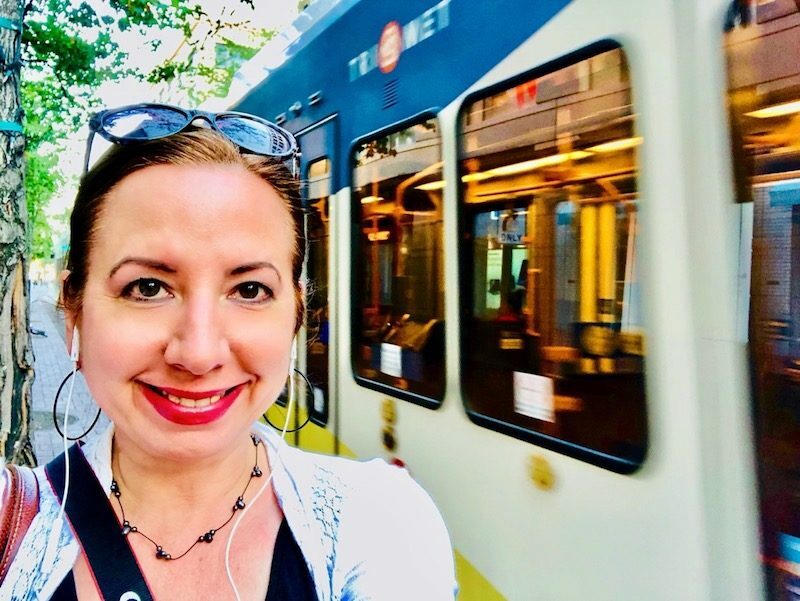 Things to Do in Downtown Portland, Oregon | Tracy Kaler's New York Life..
Fun things to do in downtown Portland, Oregon! A few weeks back, I jetted across country and spent four nights in Portland, Oregon. It was my first visit to the Pacific Northwest! I wandered around downtown Portland, eating plates of great food and drinking my share of local wines. It should come as no surprise when I say that unlike New York, Portland is a very laid-back town. I figured as much but I had no idea how friendly of a place it is. I met people everywhere. 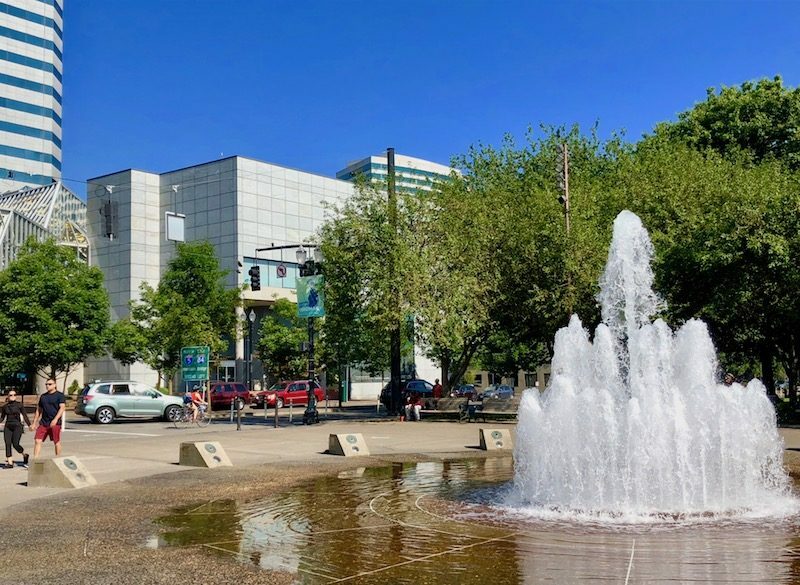 A lot of transplants from all over the United States have flocked to PDX – the city has become a favorite destination to visit, but it’s also a terrific place to live. Have you made the trip to Portland? 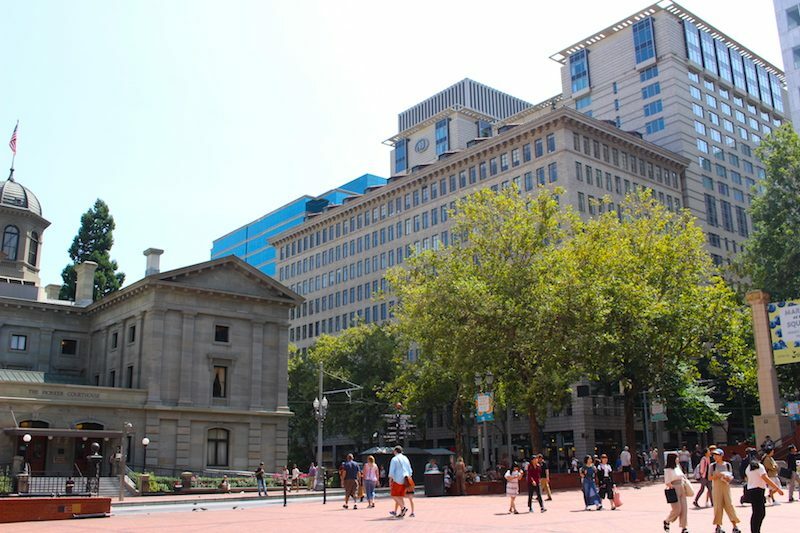 Here are some highlights and fun things to do in downtown Portland. I stayed at a lovely Hilton Curio Collection hotel called The Porter, (I highly recommend!). The property sits in the southwest section of Portland and about a two-minute walk from the Willamette River. I strolled over to this gorgeous waterfront park several times during my stay. 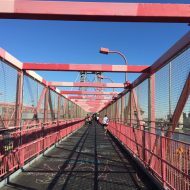 Tom McCall reminded me of Riverside Park in New York – it’s a place where Portlanders jog, bike, stroll, and meet up and it provides panoramic views of the city’s bridges. 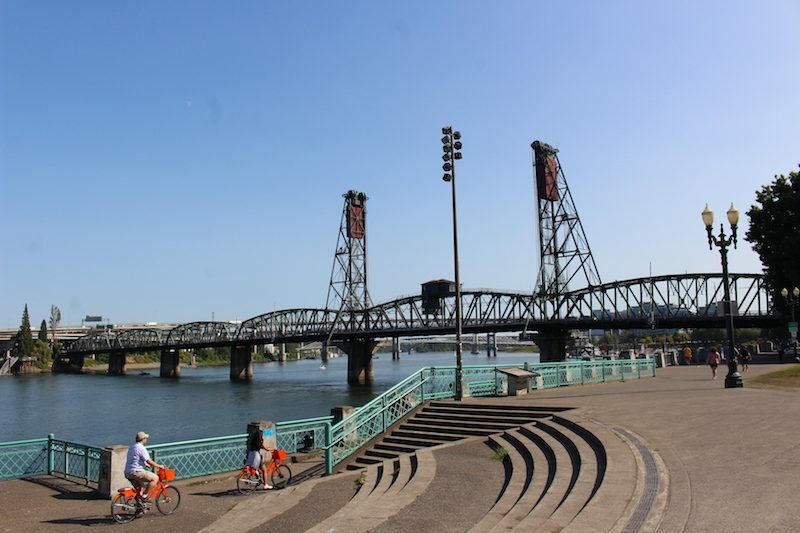 The park entrance closest to the Porter was also close to the Hawthorne Bridge, just one of 12 bridges in Portland. To get a feel for local life and the people of any city, I make it a point to visit the markets. The largest continuously operating outdoor market in the country, this arts, crafts and food emporium is open every Saturday and Sunday from March through Christmas Eve. The energy here is palpable! 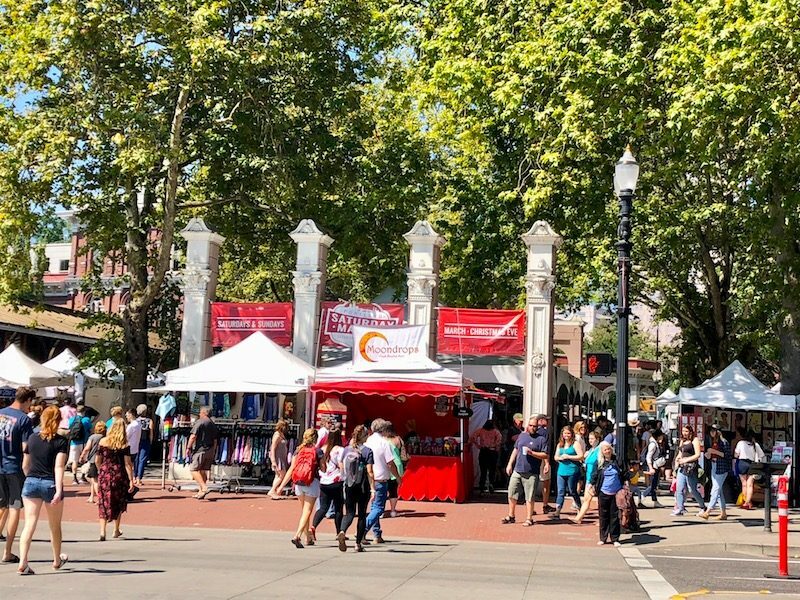 The market is packed with Portlanders so it epitomizes the true spirit of the city. Spending some time (and money) here is also a great way to support the local artists and business owners. 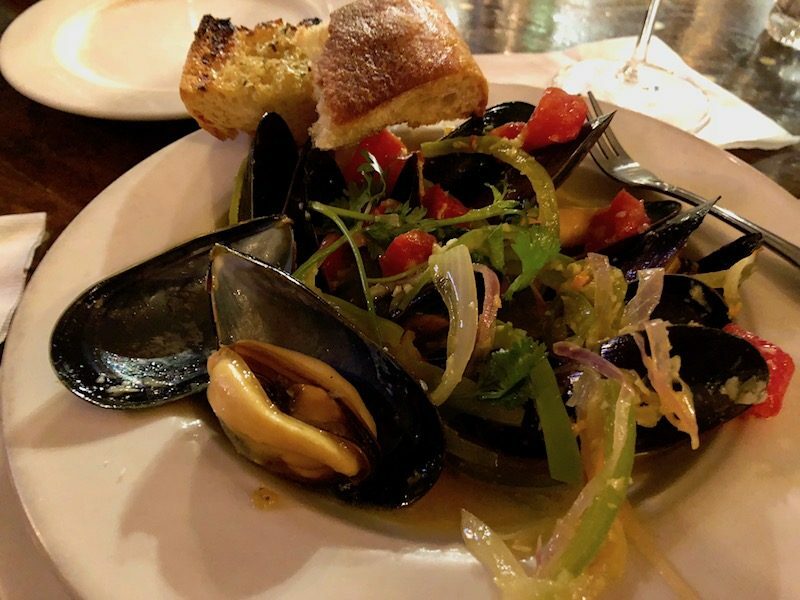 I’ve tasted my share of mussels, but the bowl I ate at Higgins – a landmark in Portland’s downtown dining scene – had to be some of plumpest and most succulent I’ve had anywhere. Why are they so yummy? While many mussels hails fro PEI (Prince Edward Island), these are Totten Inlet mussels from the Puget Sound in Washington State and they were so darn good. They were cooked perfectly and had some spice! The gazpacho was like none I’ve eaten before either. The chilled soup was garnished with Oregon Bay shrimp and cucumber. I sat in the bar, which felt like an old Parisian bistro. It was fabulous. Portland’s living room attracts all kinds, making the urban park a fantastic spot to people watch. 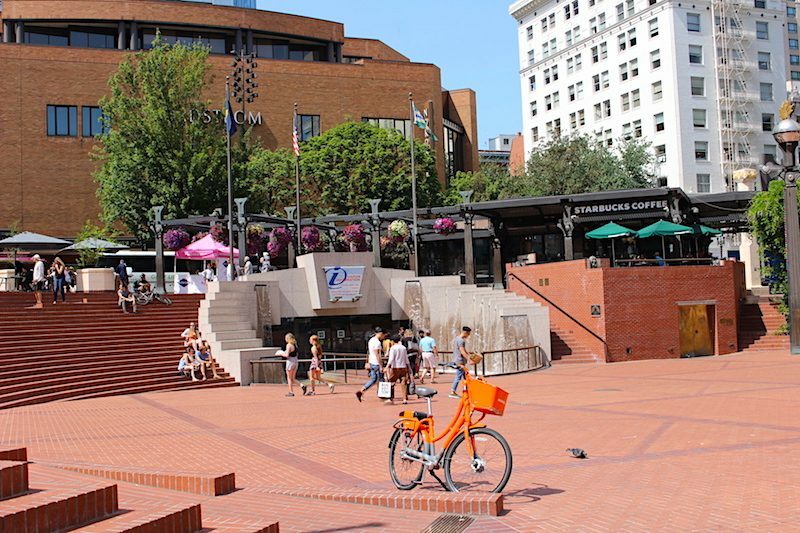 Since it’s in the heart of downtown, Pioneer Square is a good place to meet or begin and end a walking tour (some walking tours start here). Live music and other events take place year round so there’s always something fun going on. 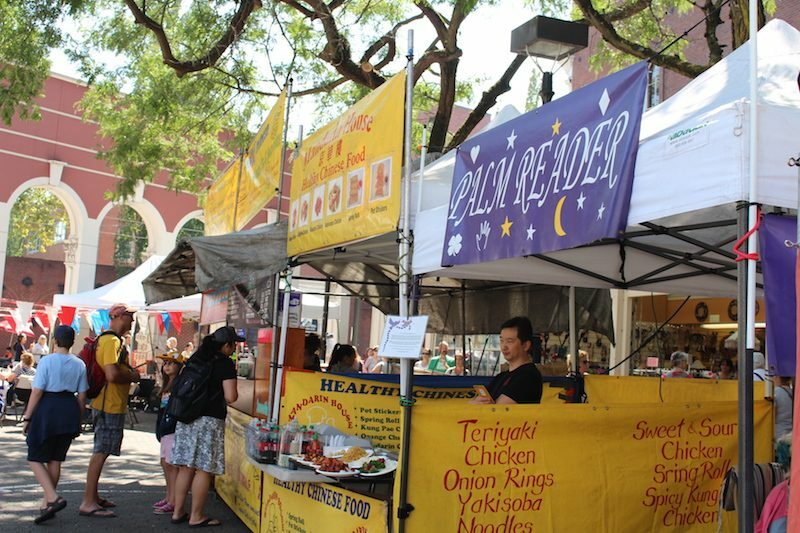 Grab a bite to eat from one of the nearby food trucks and each lunch on the steps. 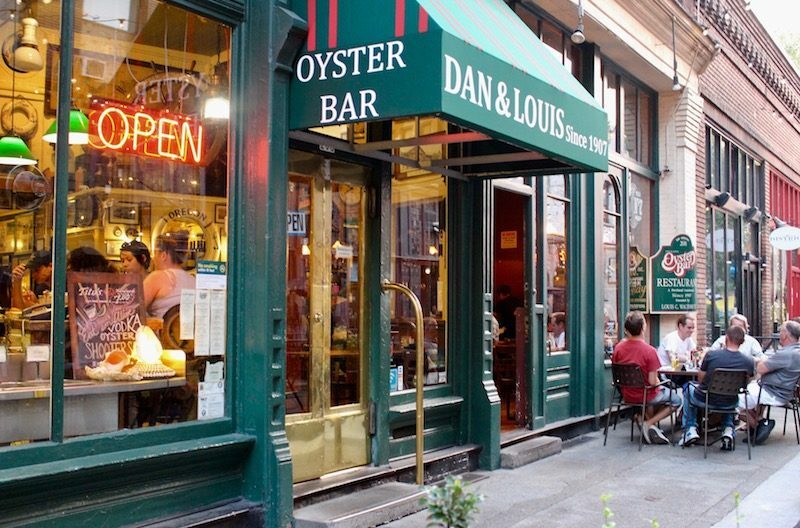 When I think of old school, I imagine a place like Dan & Louis Oyster Bar. 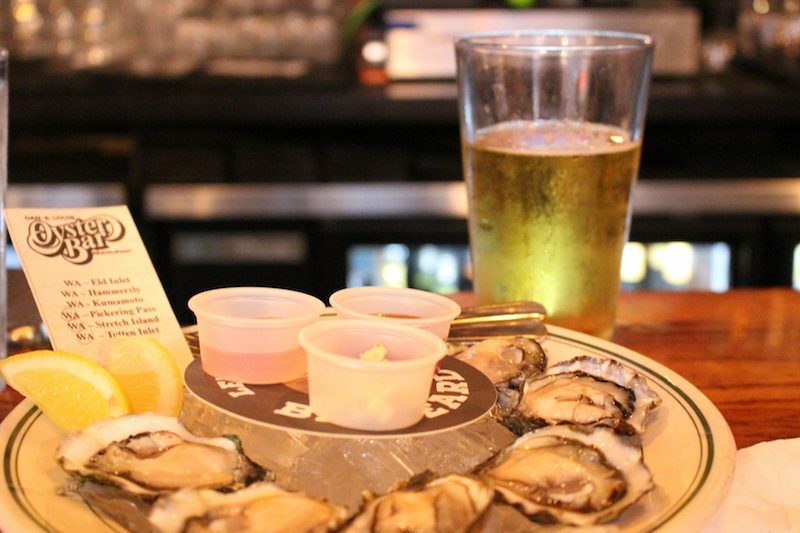 This five-generation family eatery has been shucking oysters since 1907. I opted for a half dozen with a pint of Pfriem Pilsner (Oregon) and the combo really hit the spot. Dan & Louis serves more than oysters – fish tacos, clams beurre blanc and buttermilk fried chicken round out the food choices. The bar pours a good selection of local beer and wine too. As a New Yorker, I adore the Strand Bookstore, so I had to make a stop at Powell’s. With 68,000 square feet, nine rooms, three floors sand 3,500 sections, it claims to be the largest independent bookstore in the world. 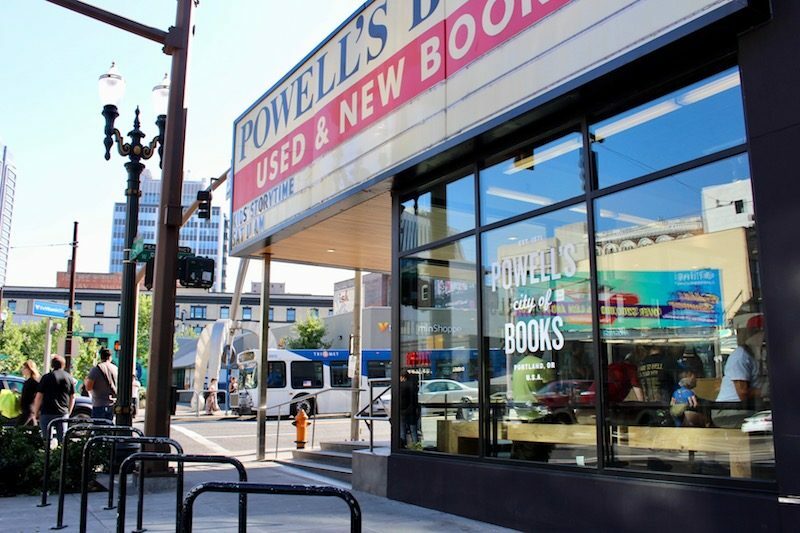 Powell’s flagship has been around since 1971 and stocks more than one million titles, aiming to connect readers with books they’ll love. It’s also open 365 days a year and has its own coffee shop. 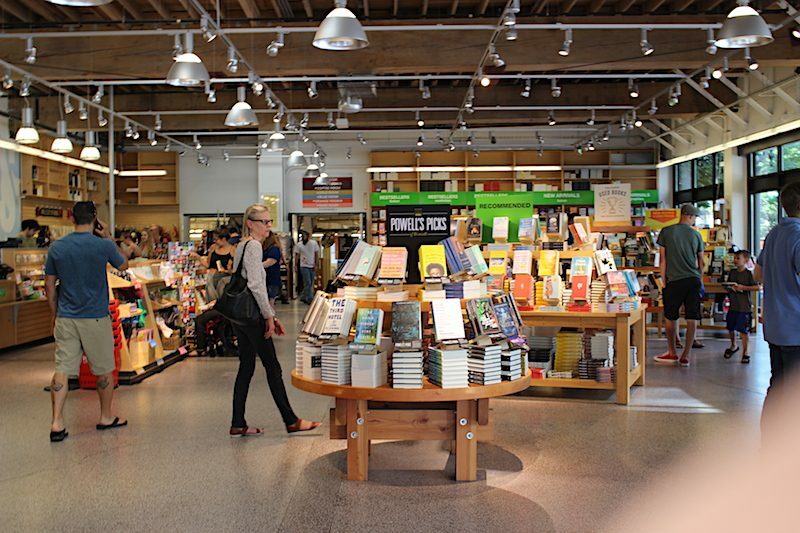 Don’t be freaked out if you get lost in Powell’s. It’s a good thing! 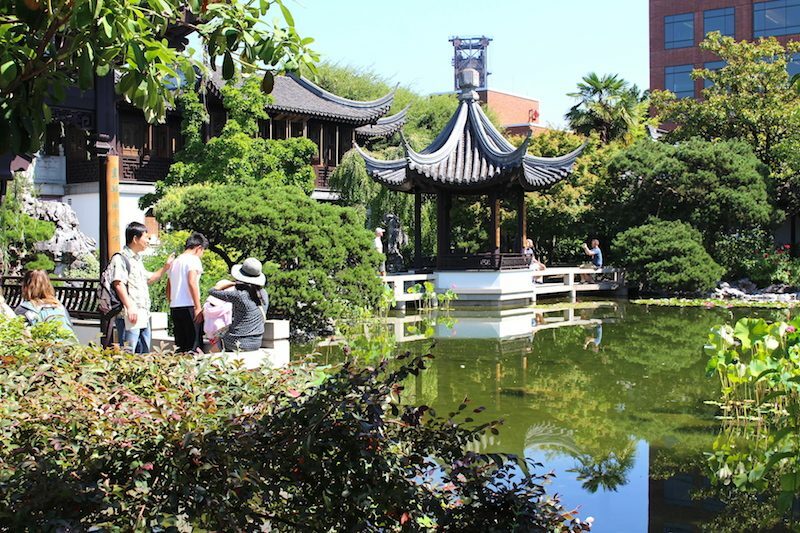 An idyllic respite, this garden occupies one city block in Portland’s Chinatown/Old Town. Most of the 400 species of plants in Lan Su are indigenous to China but were grown in Oregon, some more than 100 years old. 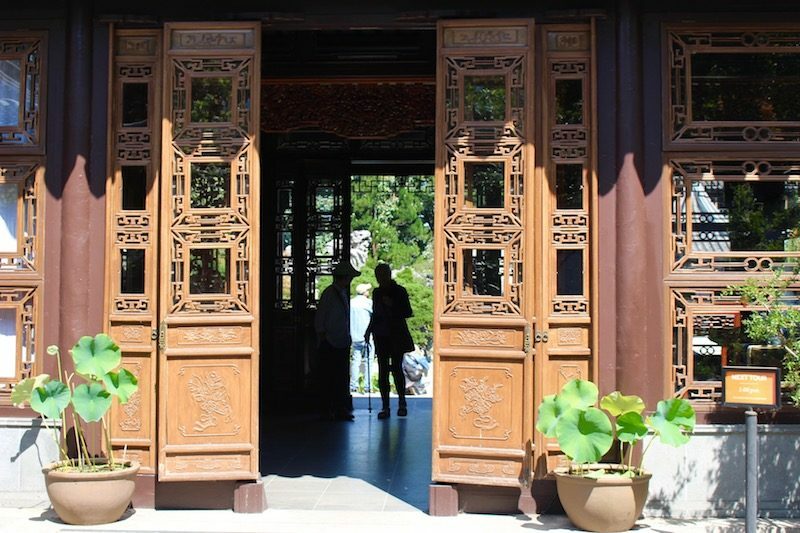 Modeled after the Classical Gardens in Suzhou, the plot features a Chinese tea house, covered walkways, bridges and pavilions and Lake Zither, an artificial body of water in the center. Su is derived from Suzhou, and Lan, from Portland – after all, Suzhou and Portland have been sister cities since 1988. Portlanders often refer to the city as PDX, which is also the airport code. You’ll see and hear PDX a lot. Portland has a comprehensive public transit system. 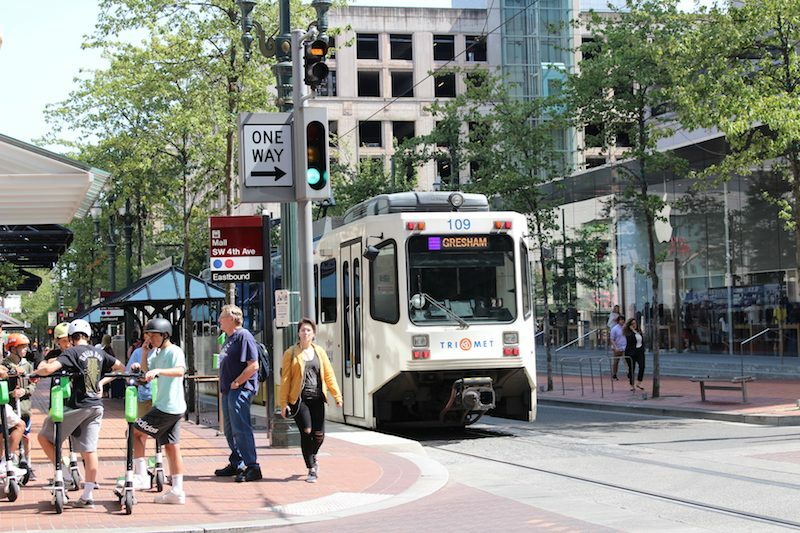 There are street cars and TriMet buses and light rail. I was focusing mostly on downtown this trip so I put on my New Yorker shoes and walked just about everywhere, so I didn’t need public transportation. I took two Ubers and they were pretty reasonable. Lyft is also popular in Portland. And there’s a bike share program too. There are direct flights from New York to Portland. Flight time is about six hours. It’s easy to get from the airport to downtown, just hop the Max light rail red line (45 minutes or so) or order an Uber/Lyft (20 minutes or so). Parts of Portland are pretty sleepy at night (I am used to Manhattan where there’s always something going on), but for the most part, the city is safe. (Just remember that it is a big city.) Some people comment that Portland has a “sketchy” feel. 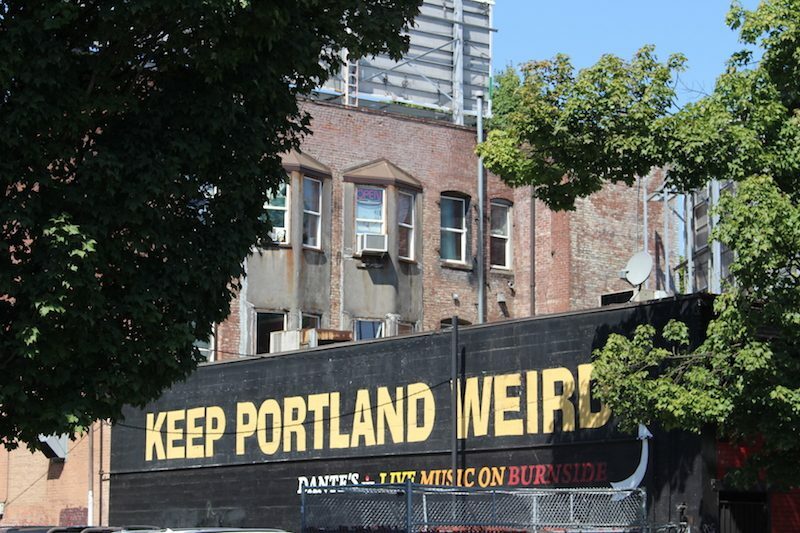 There is still a bit of grit left to the city (Keep Portland weird!) but I wandered around myself and never felt unsafe. Sadly, like New York, there is a substantial homeless population, but unlike New York, these people do not harass tourists, so no worries there. The food scene is serious. If you’re heard that Portland has some great restaurants, that is an understatement. 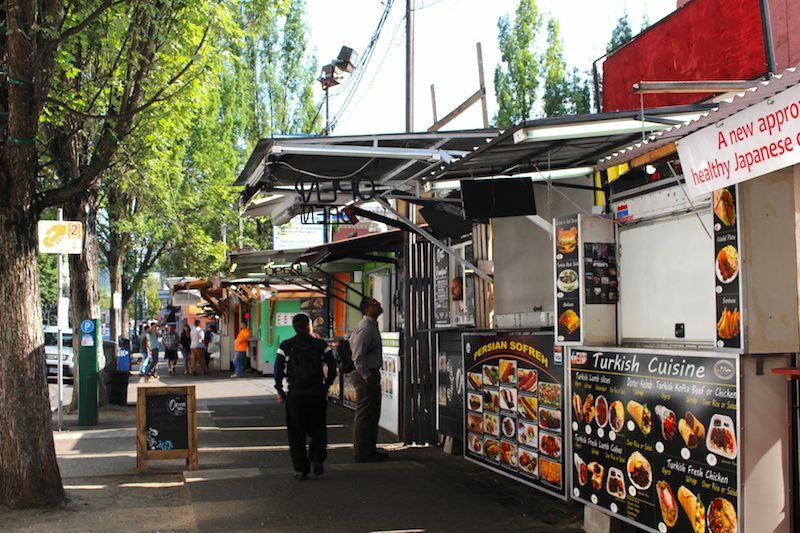 There is so much food to be had in Portland, even street food. I didn’t have enough time to eat all that I wanted. I’d go back just to eat. And drink the wine. So much of the wine comes from the Willamette Valley, which is only about an hour’s drive from downtown. It’s one of the most recognized wine regions in the world, especially for pinot noir. I left PDX for two nights and hung out in McMinnville (in the Willamette Valley) and drank a lot of pinot noir, so I can vouch! Oregon wines are outstanding, so if you’re a wine lover, you must go. And there’s beer, lots of local brews for beer drinkers. And of course, coffee everywhere. The town must run on caffeine. Even I had to have a cup of local Joe while I was in Portland (I’m not a big coffee drinker). There’s tons of green space. Little pocket parks throughout downtown provide spots to relax and take in nature. And public art! Permanent art installations are part of the cityscape of Portland. It’s not an inexpensive city. I was thinking that costs in Portland would be a lot lower than NYC, but they weren’t. Hotels will cost less, but expect to pay about the same for food and drink (maybe 10 or 20% less). Some locals told me that rents continue to increase because of the popularity of Portland. Many people have relocated to the area over the past five years and that alone is driving up prices. The people are fabulous. 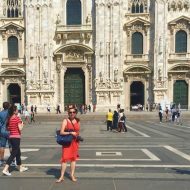 While I loved exploring the city, I was able to connect with many people on this trip. It’s an easy city to make friends, and all the fun things to do in Portland aside, the people are reason enough to visit a second time. Portland, until we meet again…. Many thanks to The Porter and Travel Portland for their assistance with this trip. 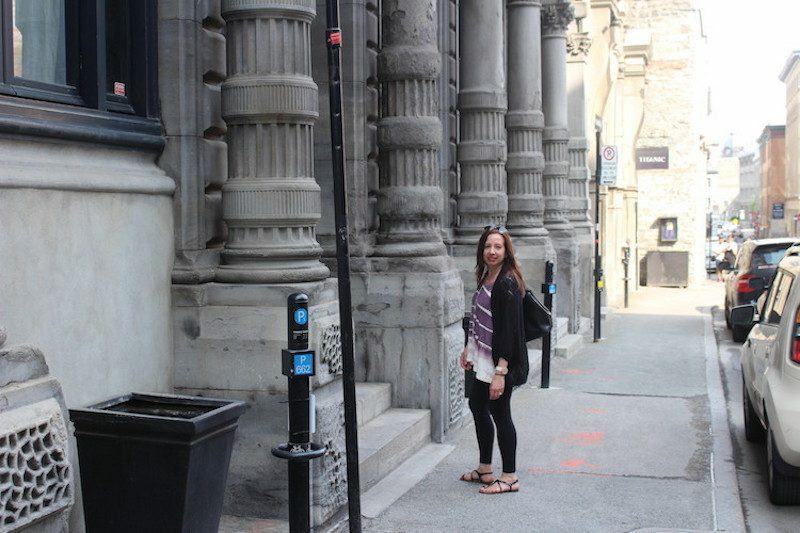 Also read about my Ottawa getaway. And my time in Austria. Plus, Scottsdale, Vero Beach, and traveling alone in Switzerland.